BATON ROUGE, La. (Reuters) - Baton Rouge held a Mardi Gras parade with a difference on Sunday -- the stars of the show walked on all fours and the theme was family planning. The second annual Mystic Krewe of Mutts "Mardi Paws" parade got underway with a chorus of barking from the king and queen and a few flat blats from a brass band. "Only in Louisiana would people turn out like this to watch dogs march down the street," said Baton Rouge Police Sgt. Gary Traylor. "Usually, a parade's a parade. But this one's a lot of fun." Organizers collected entry fees and donations to benefit the non-profit Capital Area Animal Welfare Society (CAAWS) spay and neuter program. 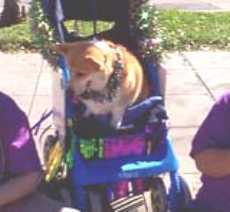 They estimated that between 600 and 700 dogs were registered in the parade. Dozens more sat curbside with their owners watching the others stroll by. "This event is as much to educate people about the importance of spaying and neutering and to have fun as it is to raise money," Mary Warren, one of the parade organizers said. "King" Max, a golden retriever who serves as a pet therapy dog at area nursing homes, and "Queen" Kodi, an Australian shepherd mix, handled their roles with aplomb, only intermittently trying to shake off their gold lame crowns. Some people provided their pets with elaborate costumes. One young woman, clad in a blue chiffon and satin harem ensemble, dressed her embarrassed-looking boxer to match. He kept ducking his head and trying to escape the parade. A Boston terrier in a bumblebee suit, complete with gossamer wings, darted in circles around his owner, dressed as a gigantic flower. 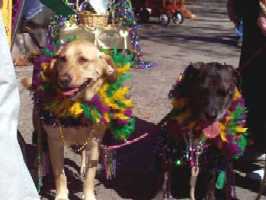 There were Indian headdresses on poodles, English bulldogs in tee-shirts, a Rottweiler in a pink feather boa. Another boxer came as an angel, with a halo attached to her leash and white feathered wings on her back.